The text which follows the above gives great detail about how Aaron is to enter the Holy of Holies: when he should come, what he is to wear, what sacrifices he is to make, etc., etc. And what precedes it? A reminder of what happened to Aaron’s sons when they did not do things properly – they died, consumed by Holy fire! It is worth noting that, included in the accouterments of the High Priest’s robe were a series of bells along the hem. What was the purpose of the bells? Some have argued that they were to let the other priests – who were not allowed inside – know that the High Priest was still alive! If the bells stopped ringing, the argument goes, they would pull him out by a rope that had been attached to his ankle! R. Hanina b. Hakinai and R. Simeon b. Yohai went to study Torah at R. Akiba’s college at Bene Berak, and stayed there thirteen years. 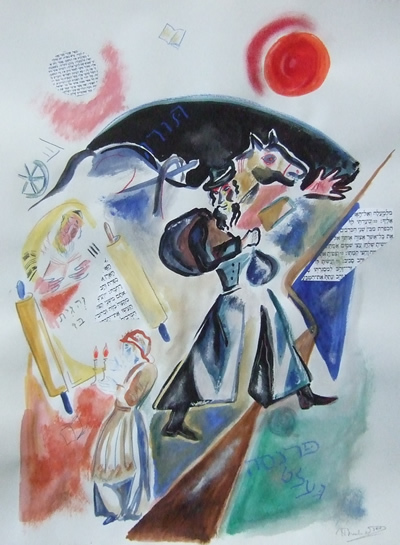 R. Simeon b. Yohai used to send home for news, and knew what was happening at his house. R. Hanina did not send and did not know what was happening at his house. His wife sent him word and told him: ‘Your daughter is marriageable, come and get her married.’ He said nothing to his master. Nevertheless R. Akiba saw it by means of the Holy Spirit and said to him: ‘If any one has a marriageable daughter he may go and get her married.’ R. Hanina understood what he meant, so he rose, took leave and went. He sought to enter into his house, but found that it had been turned in a different direction – i.e., he did not recognize it. What did he do? He went and sat down at the place where the women drew water and heard the voice of the little girls saying: ‘Daughter of Hanina, fill your vessel and go.’ What did he do? He followed her until she entered his house. He went in after her suddenly, without announcing himself. No sooner did his wife see him than her soul departed. Said he to Him: ‘Sovereign of the Universe! Is that the reward of this poor woman, after thirteen years of waiting for me?’ Thereupon her soul returned to her body. So at one level, this is a midrash about the need to treat others with care and respect. As M’ Shoshannah points out in her thoughts (want to see them? sign up for my free weekly email! ), even our "choreography" in services is resplendent with respect and courtesy. Should we not learn from these lessons and treat those around us with gentleness and caring? Of course! But, what else can we learn? 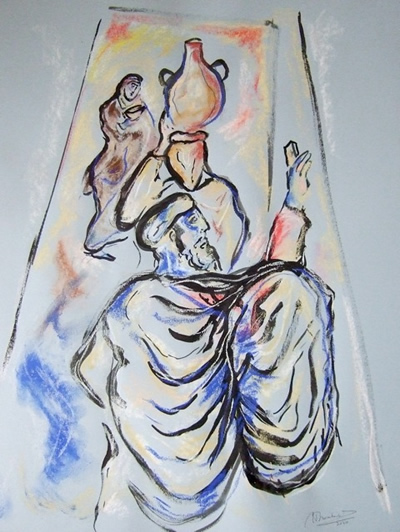 R. Hanina went to study under the tutelage of R. Akiba, one of the pillars of the Sages. He threw himself into study, abandoning his family for thirteen years. While devotion to study has always been revered – especially by the Sages! – even this was too much. He never saw his daughter grow up, he lost complete touch with his family, what a tragedy! It took his mentor to throw him out and return to his family. What about us? Are we so consumed with our careers that we lose the balance in our lives? Do we remember to feed our spirits, as well as our bodies? Another good lesson. But let’s go deeper still. Recall that this midrash is answering the question of why the High Priest wore bells on his hem. If we draw a close parallel to the story, it would seem to say that he needed to warn G!d that he was coming, so as not to chalilah (G!d forbid) "scare" the Eternal One away… How absurd!? How could such a thing even happen – would it mean that G!d cannot see us, not know where we are and be frightened by our sudden approach? Of course not. But – and here is the deeper lesson – we can "hide" ourselves from G!d, in the way children hide behind a thin cloth, or their fingers, and say "you can’t find me!" Of course we see them. But in their minds, they are invisible, and they act accordingly. Likewise, we can "pretend" that we are alone, cut ourselves off from a relationship with the Holy One, and live our lives in separation from what matters: the love and protection of Spirit. Just as R. Hanina cut himself off from his family, so can we cut ourselves off from G!d. The good news is – it’s all in our imagination: whenever we want to open the gates of our souls, we will receive and be received back into the shelter of those loving Wings. What was their transgression? The Sages probed a number of possibilities: perhaps it was the nature of the fire: was it prepared improperly, according to another people’s rituals, thereby making it "unfitting?" Or perhaps the key is in the fact that it had not been "commanded:" an offering that would have been acceptable at a different time, but in this case at the wrong juncture. Others have suggested that it was not according to a prescribed formula (hearkening back to the "unfitting" issue), and thereby forbidden. These interpretations have one thing in common: sacrifices must be offered in a precisely correct way, at the precisely correct time, in order to be acceptable. They do not allow for the spontaneity of offerings, something we as Jews have managed to embrace over time. So the Sages searched elsewhere for an explanation. R. Aha said: There is a story of a man who kept on selling his household goods and drinking wine with the proceeds. Said his sons: ‘Our father will leave nothing for us.’ So they plied him with drink, and made him drunk, and took him out and placed him in a cemetery. Wine merchants passed the gate of the cemetery, and hearing that a seizure for public service was to take place in the province, they left their loads within the cemetery and went to witness the uproar in the province. The man, waking up from his sleep and seeing a skin bottle above his head, untied it and put it in his mouth. Three days later his sons said: ‘Should we not go to see what father is doing?’ They went and found him with the wine-skin in his mouth. They said: ‘Even here has your Creator not forsaken you. Seeing that He has given you wine, we do not know what we should do to you.’ They made an arrangement amongst themselves that the sons should in turn provide him with drink, one son one day. What are we to learn from this curious midrash? Surely the Sages don’t want us to conclude that rampant, unconstrained drunkenness is a good thing? The solution, I believe, lies in us looking to wine as the standard metaphor for joy, especially spiritual joy. With this "lens," the lesson shifts somewhat: a joyful encounter with God is more important than possessions, and if we are dedicated to this quest, this invigorated life of the spirit, then even those who place well-intended obstacles in our way can be overcome. 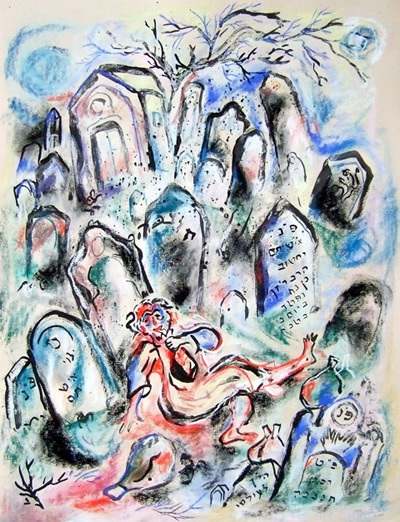 However, we cannot ignore the literal meaning of this midrash: unfettered imbibing in the pleasures of the flesh can lead us to a life where that joy is illusory, surrounded by death and the demise of those who care for us. Which interpretation is correct? As is the hallmark of our heritage, we must find a way to make them both true: not one or the other, but some creative amalgam of the two. This comes, I believe, from the lesson of balance, and the challenges we face as we try to navigate in the worlds of spirit and substance. We must find the path that leads us to unbounded joy while leaving the wisdom of saying "no" to excesses intact; the path in which the energy of the Spirit moves us through the trials of the material world at just the right pace, neither so quickly that we float above matters of consequence nor so slowly that we sink into the mire. May we each be blessed with the vision – and the community! – to help us maintain that balance, and the strength to lend a hand to others who occasionally lose theirs. As always, the first thing to understand is, "what is the question?" In this case, we have a whole series of midrashim concerned about the fact that Moses destroyed the first set of tablets that G!d gave him on Sinai – what a crime that was! What is the meaning of ‘We are the clay, and Thou our potter?’ Israel said: ‘Lord of the Universe! Thou hast caused it to be written for us: Behold, as the clay in the potter’s hand, so are ye in My hand, O house of Israel (Jer. 18:6); for this reason, do not depart from us though we sin and provoke Thee, for we are but the clay and Thou art our potter.’ See now, if the potter makes a jar and leaves therein a pebble, then when it comes out of the furnace it will leak from the hole left by the pebble and lose any liquid poured into it. Now what caused the jar to leak and thus to lose any liquid placed therein? The potter who left the pebble therein. This was how Israel pleaded before G!d: ‘Lord of the Universe! Thou hast created in us an Evil Inclination from our youth, for it says, For the imagination of man’s heart is evil from his youth (Gen. 8:21), and it is that which has caused us now to sin, for Thou hast not removed from us the instigator to sin. Remove it from us, we pray Thee, in order that we may perform Thy will.’ G!d replied: ‘This will I do in the Time to Come,’ as it says, In that day, saith the Lord, will I assemble her that halts, and I will gather her that is driven away, and her that I have afflicted (Micah 4:6). At first glance, it seems as though the author is saying, "Don’t blame us for having sinned – it’s Your fault for having made us this way!" 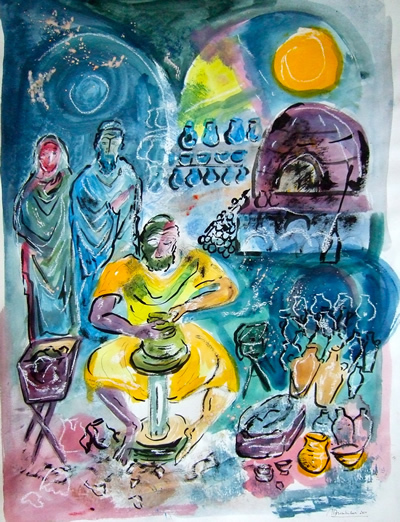 Or, to quote Jessica Rabbit: "I’m not bad, I’m just drawn that way…"
It also helps to know that the Hebrew yortzenu, "our potter," is a quasi pun with yetzer, short for yetzer hara, or "the Evil Inclination." So, like last week, we see the issue of the flaw, the distinctiveness that makes us unique, as being part of G!d’s design for each of us. In this case, the flaw is definitely negative: it is the pebble that gives rise to the leak, a defect that must be overcome. In the midrash, G!d acknowledges the flaw, if somewhat reluctantly, and promises to remove it in the "Time to Come," whether that be the Messianic Era or in Olam Haba, the World to Come. But even this begs the question: why include the pebble, why give us the flaw? The answer comes, in part, from last week’s midrash – that G!d loves us because of those "flaws" – that distinctiveness in our characters that renders us unique. Additionally, as M’ Shoshannah points out in the sidebar, we get to do the work of clearing those pebbles as best we can, trusting that eventually the Eternal One will complete the job. So, some might ask, why bother at all, if the end is to be taken care of? Because, I suggest, if the flaw is placed there by the Holy One, it is a remnant to be savored, a token of the creative act itself. By knowing our flaws, and struggling to overcome them, we engage with the Eternal One in a very holy, mystical activity. May you find your pebbles to be gravel, not boulders! Sometimes a value seems very clear: don’t steal, don’t murder, don’t lie. In the face of these simple, clear values, the question arises, why do we need a story? Why all these extra words? Isn’t it enough to just say, "treat everyone fairly?" When the Sages developed midrash, they were trying to make things understandable that were either confusing or hidden within the text. Sometimes they would use a logical explanation, but often they would turn to story – to aggadah – to illuminate their point even more clearly. What does G!d do? He draws His sword in front of him to remind him that there is a Judge above, as it says, Be ye afraid of the sword; for wrath bringeth the punishments of the sword, that ye may know there is a judgment (Job 19:29). 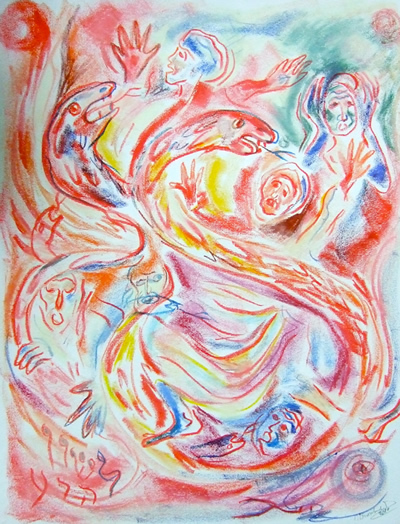 For me, the imagery of this midrash – captured so eloquently above by M’ Shoshannah! – is quite powerful. Using a very sweet carrot, we are told that the Shechinah – G!d’s divine Presence here on earth, understood to be a feminine force – sits beside a judge who judges justly, without prejudice. Yes, the stick is there too – the sword of death – but the promise of the reward is quite compelling on its own! Taking it beyond a simple reward, it is worth considering what it means to have the Shechinah present. The Shechinah is that "surface" where the Eternal One – who is in a Wholly/Holy different world – actually touches and interacts with our own mundane world. She is not a reward, per se, but is the actual event of G!d’s power intervening in our lives! Think on it for a moment – this midrash says that G!d is actually intervening in our world every time justice is meted out justly. 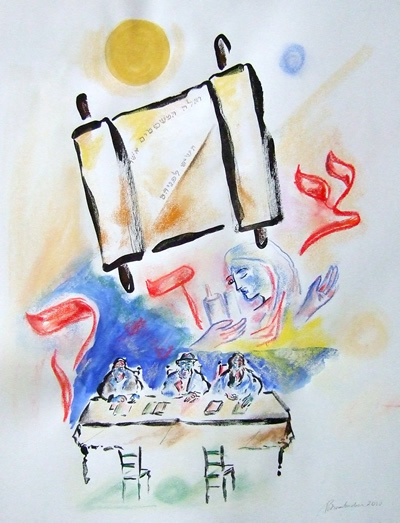 (The three red letters in the illustration say "Tzedek" – Justice). By a "simple" human action, we are given the ability to invite the Divine into this world – and also given the promise that the Eternal One, in the guise of the Shechinah, will indeed appear! How wonderful a privilege! And all we must do is be impartial in our judgments. Now, isn’t that a better presentation than the simple "don’t prejudge others"? 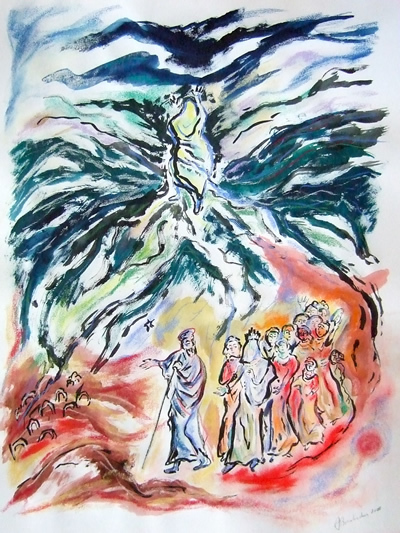 M’ Shoshannah’s art is filled with imagery that reflects her deep understanding and interpretation of each week’s midrash. While she and I discuss these elements each week, we do not impose them upon you, the reader. This is because, no matter what the intent of the artist, the viewer creates yet more art, more understanding, more meaning as they view the work. So, share with us, please – what do you see? Leave a comment below, or drop us an email!